From a director of Shrek 2 comes your chance to step into the secret world of garden gnomes— Gnomeo & Juliet. Perfect for the whole family, this fresh and funny makeover of one of the world’s most timeless stories features music from Sir Elton John, and the voice talents of Emily Blunt, James McAvoy and Sir Michael Caine. Caught up in a feud between neighbors, Gnomeo and Juliet must overcome as many obstacles as their namesakes. But with flamboyant pink flamingos and epic lawnmower races, can this young couple find lasting happiness? Complete with hilarious never-before-seen bonus features, Gnomeo & Juliet is an out-of-the-ordinary animated comedy your entire family will love. We just gnome it! Gnomeo & Juliet will be available for purchase as either a 3-Disc Blu-ray Combo Pack (Blu-ray 3D, Blu-ray 3D + DVD with Digital Copy), a 2-Disc Blu-ray Combo Pack (Blu-ray 2D + DVD) and/or a 1-Disc DVD on Tuesday, May 24, 2011. Disney Blu-ray Combo Packs provide families with an enhanced entertainment experience – with the value and flexibility to enjoy your favorite movies on a variety of platforms of choice. If you don't currently have an affinity for Garden Gnomes.....your about to! The first time that we sat down to view the all new Gnomeo & Juliet, I wasn't prepared for just how much we would all laugh and genuinely enjoy this animated comedy! The Gnomeo & Juliet storyline, bares slight resemblance to the well known Shakespeare storyline - though without the sad ending of course! The bantering and bickering between the "blues" and "reds" kept the kids (and adults alike) captivated as we watched the adorable characters battle it out (the lawnmower races are priceless! ), fall in love, and eventually make peace. The flamingo, one of our absolute favorite characters, ignited side splitting laughter on more than one occasion throughout the film! The cast in this movie is incredible, and the soundtrack from Elton John, had us all humming along. Gorgeous animation, realistic sound effects, classic soundtrack; phenomenal family film that you won't want to miss! 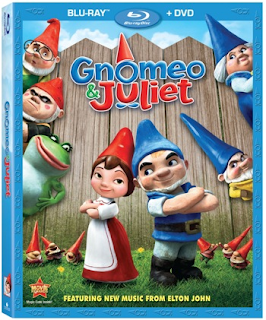 You can find Gnomeo & Juliet on DVD + Blu-ray online and at retailer's near you Tuesday, May 24, 2011! 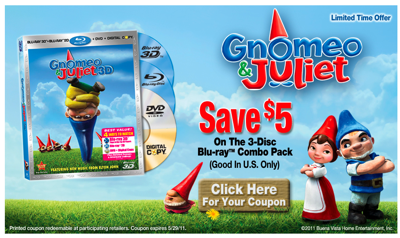 Save $5 on the Gnomeo & Juliet Combo Pack! Click above to print your coupon (Hurry.....It's A Limited Time Offer).